As some of you may know Zoe LOVES slime and makes it all the time, here is a picture of Zoe making a green one. 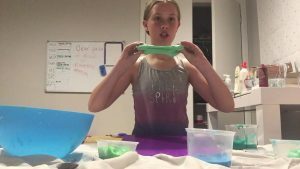 In this photo she also made a blue fluffy slime and a teal glossy slime. See ya next post, BYE!! We thought we should have a name for our ‘fans’ and we are debating on: Tronsters or Trouble-Makers. Please comment which one is better. It’s been over a year and a half since we last posted, so we thought it’s time to get back to it. troubletron on Tronsters or Trouble-Makers?